But for our purposes, we’re looking at plastic promo models. These were usually available through the parts counter at the dealerships that sold the actual cars. They were often molded or painted in the same colors available on the real cars. Sometimes they came in various body styles. They were meant as an incentive to help sell real cars. Of course, most of them ended up in the hands of little boys instead of locked away in dad’s display case, so condition becomes an issue when looking at a 60-year-old plaything. 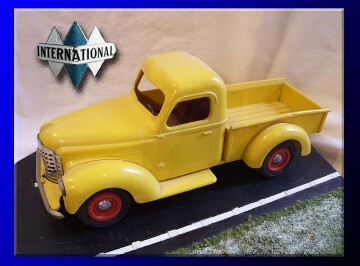 In the era of metal banks, there were a few cheap plastic scale replicas commissioned by manufacturers, but the real plastic dealer promo starts with the 1947 International pickup (inset photo). It was a little larger than the 1/25th-scale that would later become the standard. This was a very nice first effort, with separate fenders, contrasting seat and steering wheel, metal bumpers and grill, and very nicely rendered wheels and hubcaps. By today’s standards, these may look like simple models. But in 1947, there were no computers to help design this stuff, and they were starting a new form of mass-produced scale vehicles from scratch. And let’s face it; a full-sized ’47 International isn’t all-that complex anyway. 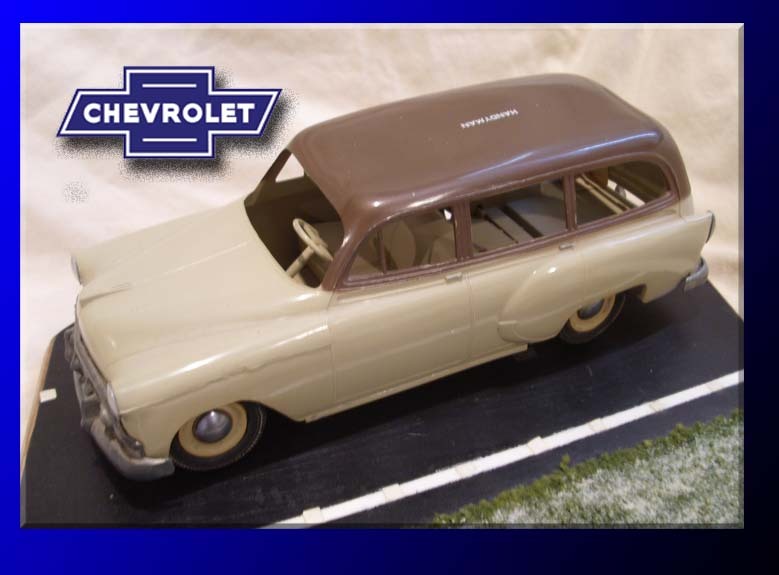 This model was made by a company called Product Miniature Corporation (PMC), and they would go on to build some of the nicest models in the early era. 1947 International by PMC is one of the first plastic promos. 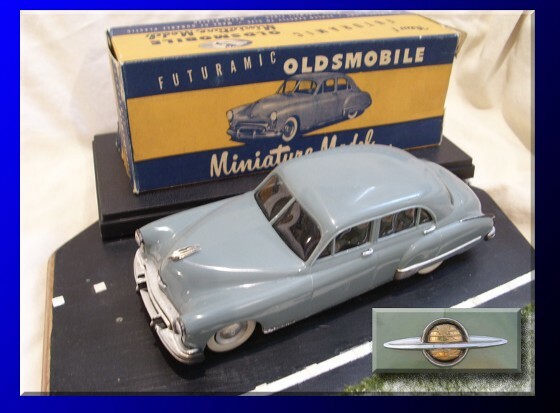 Author photoThe other big model manufacturer of the day was Troy, Mich.-based Aluminum Model Toys (AMT). Unlike PMC’s molded plastic chassis and little hubcap layout, AMT’s were usually plastic bodies screwed to a tin bottom. AMT covered more different makes of cars than did PMC, and most early promos that you find today were AMT products. Also, unlike PMC, AMT is still in business today (albeit through a maze of mergers and owners) producing various plastic model kits. One of the most sought-after models of the early era wasn’t produced by AMT or PMC, but by Cruver Models of Chicago, Il. Cruver was primarily known for making scale airplanes and tanks, but their one foray into cars was a stunner. The 1949 Oldsmobile 98 four-door sedan promo had some serious detail for its day. Separate rocker panel trim, emblems, and even door handles were exquisite features of the model’s design. Even the box was a work of art. Of course, all of these tiny bits were easy to break off, which means not many of them survived intact. Then complete models became so valuable that reproduction parts became available. Then all the parts ended up getting reproduced, which meant whole, reproduction cars showed up on the market. Someone even reproduces the box. Anyway, if you want to see an original Cruver ’49 Olds with the very same box it came in 61-years ago, just look to the top of this story. In spite of their age, some early dealer promo models aren’t that hard to find today. Occasionally they turn up at antique malls, swap meets, and garage sales. There are various dealers that sell them on the Internet. Sometimes you can stumble across a model car show & swap where a whole room full of similarly minded model geeks converges in one room. And then there’s eBay. One of the best things to happen to the promo model car hobby—and one of the worst. Browse through the ‘Bay long enough, and you’ll see pretty much every model ever made at one point or another, no matter how rare. And if you have the money to buy it, it can be yours. On the down side, it takes away the “thrill of the hunt,” so to speak. Sometimes things seem more special when you find it where you least expect it. eBay is almost too much of a good thing, and yet, it can keep you out of the game if you don’t have a big enough wallet. One of the best parts about looking for model cars on eBay is that occasionally you can find one that looks like a basket case for not much money, but if you know what you’re looking at sometimes you can recognize a diamond in the rough. Along those same lines, sometimes you buy one that somebody “restored,” and realize it isn’t as nice as you hoped once it shows up in your mailbox. Promo model collecting can be a fun and rewarding experience. If you remember having these as a kid, or even if you like the actual cars, it is nice to hold a piece of automotive history in your hand. Where has that model been all these years? What is its story? It can all be so fascinating. And since not everyone knows what these cars are, your collection can be as unique as you are. But to build that collection from scratch, be ready to search long and hard for the models you want. Or be prepared to spend a bunch of money. Either way, your vintage models are out there waiting for you to bring them home.